ISMS MBA has been ranked top 24(2012-2014) by The Pioneer, The Sun Magazine, Silicon Valley 2015 Bschool Survey. ISMS Business School is the first in South India and among a select few to receive the two most widely recognized MBA Program accreditations through University of Mysore. Students can choose Global MBA Program Package with five value added Programs along with total personality development module, Business Intelligence Tools from IBM India. Foreign Languages and Expert Business Leaders Lectures are included in Global MBA Package. 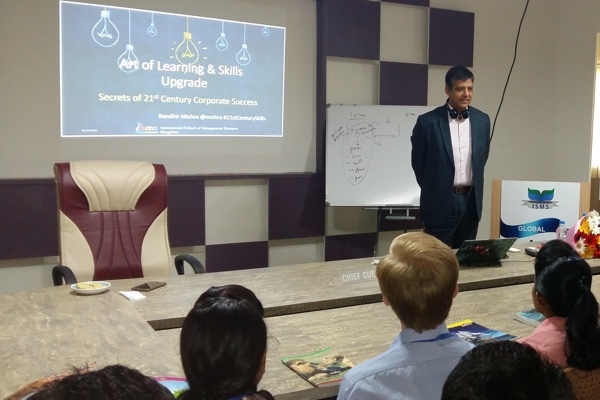 Participants at ISMS Business School gain insights from 60 experienced faculty members from across India. These faculty members are top academics, business advisers and researchers in their respective areas with PhDs from leading universities. Through optional international field trips also known as Business Study Missions(BSM), and exchange and summer programmes with many B Schools worldwide. Past destinations for BSM include Argentina, Myanmar, Mongolia, New Zealand and South Africa. Be part of a family of ISMS Alumni placed in Global MNC’s through out India working in top positions. You can take part in alumni activities and enjoy a host of privileges, which you will find useful and beneficial to your career development and beyond. 10: ONE OF THE MOST BEAUTIFUL CITY WITH BEST CORPORATE NETWORK. Active Interaction are encouraged so that traditional lectures can transform into open discussions. And discussions can lead to face-to- face feedback between professors and peers.